Home / Events / Cathie Suggestions, Retail Sale, Warehouse Sale / Images That Suit – Save Up To 90% OFF! Images That Suit – Save Up To 90% OFF! Shop the latest women’s work to weekend wear in available sizes from 2-16! Variety of items for sale including tops, skirts, pants, jeans, blazers, suits, dresses, jewelry and footwear. 50% – 90% OFF clothing & footwear! 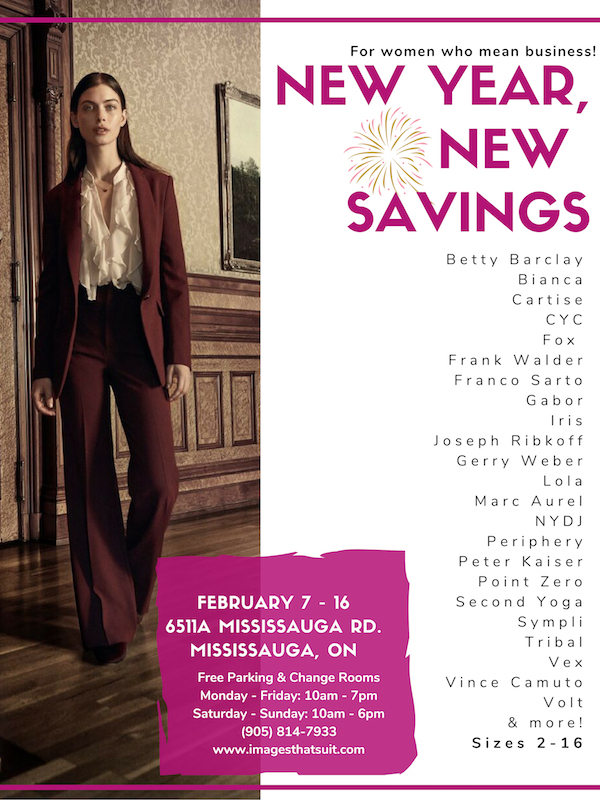 There are a wide variety of brands to shop from such as Betty Barclay, Bianca, Cartise, CYC, Fox, Frank Walder, Franco Sarto, Gabor, Iris, Joseph Ribkoff, Gerry Weber, Lola, Marc Aurel, NYDJ, Periphery, Peter Kaiser, Point Zero, Second Yoga, Sympli, Tribal, Vex, Vince Camuto, Volt and more! Monday – Friday: 10:00 a.m. – 7:00 p.m.
Saturday-Sunday: 10:00 a.m. -6:00 p.m.
Never miss a sale event again!